Magnesium, a vital mineral for horses, is freely available in the grass they eat. It has over 300 known uses in the body. Magnesium contributes to a vast array of bodily functions including the ability to help regulate blood sugar levels, the formation of hormones and enzymes, the conversion of glucose to energy, maintenance of a healthy nervous system and formation of bone and red blood cells. Horses deficient in this important element can show signs of nervousness, wariness and excitability as well as muscle tremors. Previous research from Cornell University shows that horses need to consume around 5mg of the mineral daily to carry out normal body functions. A study of Magnesium uptake in horses by Ohio State University found that the magnesium requirement of a typical horse was 13mg/kg of body weight per day. Horses still growing, lactating or working use more (Magnesium can be lost in sweat). What are the signs of a magnesium deficiency? 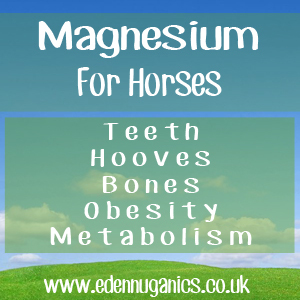 Healthy hooves - Magnesium is often spoken of as a miracle mineral commonly lacking in the equine diet. Calcium requires Magnesium in order to be absorbed, making both of these key minerals essential for healthy hooves. Strong bones - Magnesium is essential for bone formation. Not only do horses need Magnesium to absorb calcium, but a large percentage of the magnesium found in their bodies is stored in the bone. Obesity - Magnesium even plays an important part in reducing equine obesity, and can lessen the risk of laminitis in animals prone to it during periods of strong spring grass growth. Strengthen teeth - Soft teeth are a common problem with horses, many of which needing costly dental work or even extractions to relieve the pain. Magnesium helps to re-mineralise your horses teeth, helping them to become stronger and more durable. Sugar metabolism - Magnesium is used in every cell in the body as part of the process of converting blood sugar into usable cellular energy. As such, it's possible that a deficiency in Magnesium might impair sugar metabolism. How to use Magnesium for your horse? All forms of dry Magnesium chloride are bitter in taste and more than likely something your horse will choose not to eat out of free will. However, it is easy to mask this issue by simply dissolving the flakes in water (warm water works faster) and adding this Magnesium solution to your animals feed. It's best to introduce Magnesium slowly to their diet. Dissolve 15g, which is around 1 large tablespoon of Magnesium flakes into 200ml of water, from this add around 10ml a day to your horses feed. Over the course of around two weeks increase the dosage until 50ml is being added each day. Starting with a weak solution first allows the horse's body to adjust to the new found source of Magnesium. Do all horses need magnesium supplementation? The simple answer is no. Many places in the world have sufficient Magnesium available in the pasture to support your horse. However, in the winter months, while being fed dry food, supplementation can become essential. Even if there seems to be enough fresh grass all year round hard working horses loose a massive amount of Magnesium through perspiration making supplementation a valid option. "As there is generally a large amount of magnesium in vegetative matter (i.e. grass, hays and grains), deficiency is rare in horses." - Allison J. Stewart. A great way to include Magnesium in your horse's diet is by adding a Himalayan salt lick. This ancient salt is mined from deep underground where it has remained hidden from environmental toxins for thousands of years. Unlike other salts Himalayan pink salt contains all known trace minerals and is highly beneficial to the health of your horse. Magnesium & Horses. What's The Deal?